Tie in fine copper wire at 1/4 distance from bend. Apply dubbing and build up soft body working forward to 1/4 distance from eye. Make 3 to 4 evenly spaced turns of copper wire, working toward the eye. Tie in. Take 1/3" of starling primary and roll between finger tips. Tie in infront of body. Tie in starling hackle in front of wing. 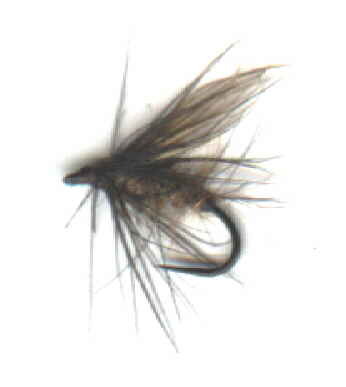 Make 2-3 turns of the hackle only. Correct length should clearly overlap point of hook.